After a rainy, dreary weekend here in north central Texas, I bring you a ray of sunshine. Yep! These rolls are just what the doctor ordered to chase the cold and wetness away. My older sister has been telling me about a restaurant where she eats the BEST orange rolls. Unfortunately, this sister, who lives several states northeast of me, has never taken me to this place. She is obviously trying to taunt me. Instead, I have been inspired. I decided to come up with my own orange rolls adapting the recipe of my Favorite Dinner Rolls. 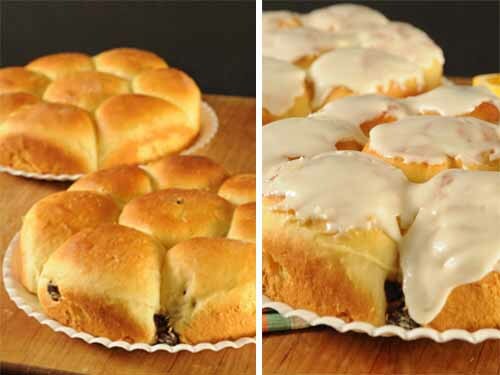 After quizzing Kay in greater detail, there is likely no resemblance between my rolls and the famous rolls—but no matter. I love these! 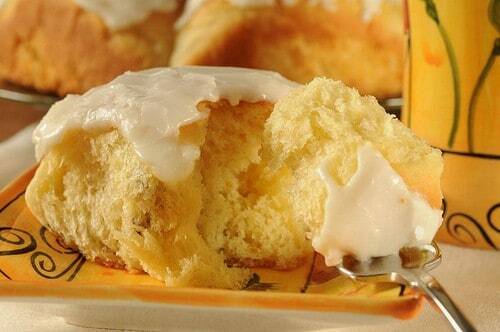 They are light, fluffy, and sweet with a distinct orange flavor. Bread like this is why I eat a jar of salad every day for lunch. Seriously. Otherwise, I couldn’t fit in my clothes. Homemade bread is my Achilles heel. I made these in the bread machine but don’t feel left out if you don’t have one. Click here to see directions for using a large electric mixer instead. If making nice round dough balls has you stymied, check out the video below. Spoon Orange Glaze over rolls when cool. Warm milk for 1 minute in the microwave. Add to bread machine along with egg, orange peel, orange juice, shortening and salt. Add flour and yeast on top. Start bread machine using dough cycle. Check dough after 7-8 minutes and make sure it is the right consistency. Click here if you are new to using a bread machine. Evenly space 8 dough balls in an 8 or 9-inch round cake pan (greased or sprayed with flour/oil aerosol) with a dark finish, preferably. You will end up with two pans of rolls. For a tutorial on making rolls, check out my video below. Cover loosely with a tea towel and let rise until almost double. Preheat oven to 375. Place rolls in oven and bake until golden brown for approximately 10-15 minutes. If you have a baking thermometer, rolls should register close to 190 degrees before removing from the oven. Add 1 tablespoon orange juice to 1 1/2 cup powdered sugar. Can I make these the day before and refrigerate them? How does that work? Holly, You can refrigerate after rolling them out and putting the dough in the pan. You will need to allow extra time for them to rise the second time in the pan the next morning. Probably at least an hour extra. Or you can refrigerate the dough before rolling it out but after the dough cycle has completed. You may have to experiment a bit. I can’t wait to try these. What size pan do you use? If you said that, I missed it. I have a cake pan, but it’s nonstick and dark. Would that do, or will the rolls burn? I was very glad to find all the bread machine recipes you have and look forward to working my way through them. Thanks! Oh, I see now that you said in your video on dinner rolls that a dark pan is good! Still curious about the pan size, but I will give it a go with whatever seems okay. Heather, 8 or 9-inch pans. Two of them. You could also use a 13×9 inch pan but I like the way they bake best in round 8-inch pans. Oh and yes I iced them by your recipe. I made the orange rolls for a Thanksgiving breakfast treat, except I rolled them out & spread butter, Marmalade jam, & brown sugar on them. Rolled them up from the long end, pinched the dough together & cut them into individual rolls. The way you do the Cinnamon rolls. Yum, soooo good!! Hope you had a great Thanksgiving!! They look great. Check Goodwill or thrift stores for breadmakers, that’s where I found the ones for my mom and me. What a great idea!! So many people don’t realize the treasure they have in a bread machine so most sit unused. Thanks for stopping by. Oh YUM! These look and sound outrageously delicious!!! What a nice change from cinnamon rolls, they look so yummy! Wow. You see, anything that has orange flavor is a weakness of mine. Oddly enough, I don’t like actual oranges! But this… oh this… I would eat this. All of it. orange rolls are a fave of mine. these look super easy, except I don’t have a breadmaker. KA to the rescue i guess! These rolls look great, and that glaze! OMG it looks amazing! YUM! Can’t wait to try your recipe. Think I will try the Amanda Cookin’ version also. Have to Lipscomb friends here till tomorrow. May cook them for breakfast tomorrow. Love anything with orange in it, especially bread! Great rolls, thanks, I will bookmark this. Lovely! 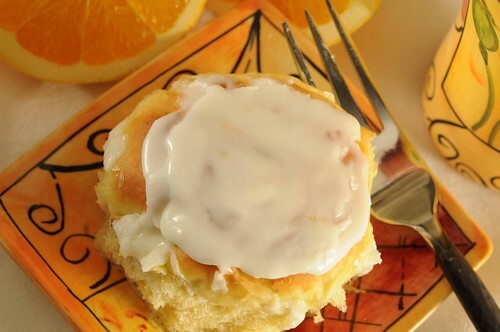 I love orange rolls, these look wonderful 🙂 I have some on my blog too that are rolled up cinnamon roll fashion. Tasty! Well, just in time. I was looking for something “cinnamon-rolly” to take to work tomorrow… but I don’t have a bread machine. I’ve got every other gadget and contraption… These truly look wonderful – I might venture into the “manual” method!! !